I had been asked to write a “Day in the Life of a Racing Greyhound” and here is an excerpt, written from the perspective of the dog. 6:30am: Rise and shine! I get to wake up to all of my caretakers letting us out. I go outside in a group of 15 boys and we hang out outside for about 30 minutes. We sniff, smell, and take care of nature’s call. We have 3 different pens that we get to go into … and more sniffing and smelling take place. At 7:00am I come back inside. 7:00am – 8:00am: My caretakers are cooking rice and pasta in the kitchen. This will go in our dinner once its cooled. My caretakers start cleaning all of our kennels. Some dogs get to leave the kennel and go exercising. 8:45am: I get weighed and my weight is recorded in a kennel log. My caretakers groom me, check my feet, check my nails and my ears, and then brush me with a grooming glove. I go back into my kennel and nap till dinner time. 9:00am – 10:00am: Dinner time! I get a 1/2lb meat ball with some vitamins and vanilla Ensure on top. Yum! Because I got a 1/2 “snack” that means I am racing today!!! 10:00am: I go back outside with my group of 15 buddies and we take care of nature’s call, do a little sniffing, watch some of the other’s kennel staff, and just lounge around for 30 minutes, getting to go into each of the 3 pens attached to our kennel. 10:30am: I go back inside to the kennel. When we come back inside, my caretakers sweep, mop, and clean the kennel so its all clean and comfortable. 11:00am – 11:30am: I hear leads clinking!!!!!! Woohoo! I am going racing!!!! My caretakers put a lead on me and I go walking with 2 of my buddies. We walk from the kennel to the racetrack … we pass the grassy area with trees, and we sniff and take care of nature’s call … and if we are really lucky, we will see a squirrel!! We love watching the squirrel run up the trees! We walk to the Paddock area of the track and get weighed. I have to be within 1.5lbs of my set-weight or I won’t be allowed to race. I am 84.5lbs, the clerk of the scale records my weight and my caretaker brings me to the racing kennels. A track employee takes me and puts me into a kennel where I will stay until its time to race. Major pictured with permission from D’Arcy Kennel. 1:30pm: Track leadouts come and get me! They put my leash on and we go walk outside in the warm up area. A lady in a lab coat follows me as I take care of nature’s call and my sample goes into a plastic container and a label gets put on it. The track vet is there watching us walk and making sure that we are all okay. Then we get to go to the Paddock area, where the Paddock Supervisor will check my weight and then put on my racing blanket. The Paddock Judge comes and checks my ear tattoos (to make sure I am the correct dog), and then he checks that my racing blanket fits correctly. 2:00pm: I walk onto the racetrack wearing the green blanket of post #4. I am pulling at the leash and the leadout walks me onto the track for the post parade. We walk in front of the spectators and I catch a glimpse of the toteboard … I am 5/1 to win my race. The leadouts walk us to the starting boxes and we wait for about 5 minutes. I get loaded into the starting box and I can hear the lure coming towards the start …. the boxes open and I am in 3rd place. I close ground on the greyhounds racing in front of me and when I turn into the homestretch, I accelerate and leave the field behind me! I won! I won! I am so excited! The lure stops at the pick-up and we all stand there wagging our tails, so excited! The leadout puts my leash back on and I walk off the track to my caretaker. 2:15pm: My caretaker brings me to the cool down area and I get my feet cleaned and cooled off and then I get to walk through the cool-down tank … it’s a cool water tank that we can walk through to cool down on a hot day. I walk back to the kennel with my caretaker and when we get there they clean my face, feet, and wash my eyes. I go back into my kennel and drink some water. I nap for an hour or two. When I am all cooled down, I get my dinner!!! Meat, kibble, rice, pasta, and some vitamin supplements. Yum! Then at about 4:00pm, I go back outside for a few minutes to take care of nature’s call. I come back inside and get a couple of Milk Bone cookies!!! Yeah! 5:30pm: My caretakers come and let me out with my 15 buddies. We spend about 30 minutes outside. 7:30pm: The night races start and my caretakers are in the kennel taking care of other racers. 8:30pm – 10:00pm: My caretakers come and let me outside with my 15 buddies. We are outside for about 30-45 minutes. We get to go through the 3 different pens and sniff, smell, lounge, and hang-out. 11:00pm: My caretakers wash dishes, sweep, mop, and tidy up the kennel. They leave about 11:30pm and the radio is left on for us with some easy-listening music. We sleep and dream. I have water if I am thirsty, and a nice bed of shredded paper. I dream of winning races! 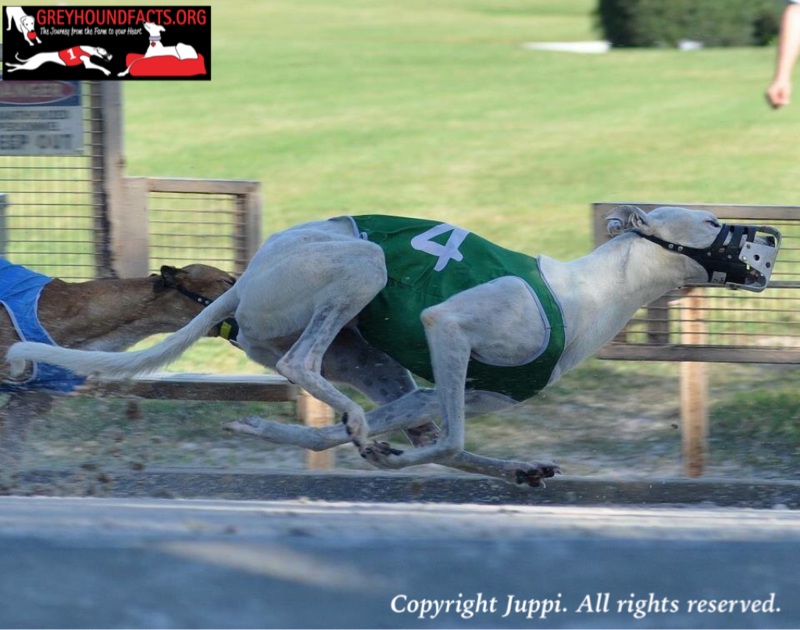 By 15-18 months of age, most of the pups are ready to move to the track and begin their professional racing careers. The training they have received on the farm, called finishing, is meant to prepare them for life at the track. They’ll understand the basics of kennel life with turnouts, feeding schedules, training, and grooming. Most importantly, they’ll have the basics of racing: chasing a lure, navigating the turns, and racing with other dogs. “Benching” is very important in the care of a racer. It is more than just a brief “once over”. The trainer is looking for everything from muscle soreness, swelling, small cuts, sore cuticles and shucked nails, to fleas and ticks. Normally, it is done the day after a race in order to catch anything that might be bothering the dog and treat it appropriately. If something more serious is suspected, such as a bone injury, the dog is taken to the vet for an x-ray. At all stages of their lives, the dogs receive a great deal of attention, handling, and care from the people around them. They also have a lot of opportunity for play. The reasons for this are obvious: an unhappy dog doesn’t learn quickly, nor will it run well. A dog that isn’t used to being handled can be difficult to deal with, and no one wants a kennel full of unhappy, hard to handle dogs. Littermates often run at different tracks and become kennelmates with dogs from other farms. Once they’ve settled in and gotten acquainted with their new kennelmates and trainers, Unofficial Schooling begins. Unofficial Schooling takes place in the morning on the track before the day’s races. Initially, the pups are hand-slipped so the trainers can see how they are running, and if they are following the lure. If that goes well, they run out of the starting box, first in pairs, working up to running in groups of four or five. This continues until the trainer feels the pup is ready for Official Schooling. Official Schooling races are held before the main races. Most dogs run in 2-3 schooling races. These races help the trainer evaluate the dogs. 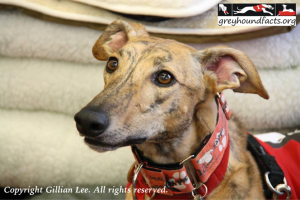 Is the pup ready to move to their Maiden race and begin his career? Should the pup be moved to another track? Each track has different levels of competition and track conditions. Most greyhounds race twice a week. On non-race days, they exercise with kennelmates in a sprint path. Some dogs enjoy a soak in a whirlpool to ease tight or sore muscles and others may swim at the beach. The dogs are turned out an average of five times a day. Each turn out is typically 30 to 90 minutes and vary depending on the weather. The dogs are outside for a shorter period of time when it’s too hot or raining, for example. Muzzles are worn as a safety precaution. Greyhounds have notoriously thin skin. Males and females are turned out in separate fenced in areas. Professional athletes, like greyhounds, are fed high quality food that meets their nutritional needs. The meals consist of raw meat that has been frozen, kibble, a carbohydrate such as rice or pasta and/or fruits and vegetables. Each trainer has their own formula regarding vitamins and other supplements. On a race day, the dogs have their usual turnouts. After being turned out, they are carefully checked and weighed. This weight is recorded in the kennel log. They have a morning snack and then rest. About an hour and a half before post time of the first race, a kennel employee takes the racers to the track. Here a track employee brings them to the ginny pit where they wait until it’s race time. They are weighed, (which is overseen by the track vet, a judge and other officials) given a tag which indicates which race number they are in, and the blanket they will wear. The racers must be within +/- 1.5 pounds of their set weight or they are scratched (unable to race). Shortly before their race, the leadouts walk the dogs and a urine sample is collected and labeled. In the paddock area, they dress the dogs (put on the racing blankets and muzzles). The dogs are walked onto the track for the post parade and then led back to the starting boxes where they are put in one by one. The announcer introduces the lure, the doors open and the race is on! After the race, the lure is stopped at the escape turn where the leadouts leash the dogs and hand them back to their trainers. The dogs are given water, cooled down with hoses, kiddie pools or dip tanks, and the sand is cleaned off, making sure to pay special attention to the eyes and the feet. When they return to the kennels, they are turned out, fed, and put to bed. Win or lose, they get extra treats! Once the dogs have won a Maiden Race they move to the graded races starting at Grade D. Depending on their success, they move up or down a grade. Grade A is the highest grade at most tracks although some have AA. Greyhounds may also move from track to track during their career depending on the level of competition, how well suited the track is to their running style or if it’s a seasonal track. For a great write-up about Race Day from the dog’s point of view see Catherine D’Arcy’s blog post. Check out the blog articles in the Track Life category for more information. When people learn that I raise greyhounds the first question I am generally asked is what happens when they don’t run fast or can no longer race. This is what happens! Meet Otto, formerly known as Slappin’ which was short for his registered name of Slappin’ Da Bass (from the movie I Love You, Man!). Otto was born in my home in Texas. Yes that’s right, in my home. Quite honestly, I’ve since learned that raising a young litter in the house really isn’t an ideal way to go about it – but I enjoyed it. At about 4 months old Otto was a pup bursting with energy, far different from the relaxed retired racer you may know, and it was apparent he wanted more room to run than I could provide on my property. I’d take them to run in the park but their poor feet would become covered in sticker burrs. He and his litter mates went to stay at my friend Steven Powell’s farm out near San Antonio Texas where they could run their little hearts out in sandy, freshly tilled dog runs that were several hundred feet long without a sticker burr in sight! It was an ideal place for a greyhound to grow up. Steve’s farm helpers were his children, which was one of the reasons I chose him to take care of my pups. They certainly never lacked attention. Otto went on to train at Buddy Scitern’s C&C Greyhound Farm at twelve months of age. Those that are familiar with Buddy and Carrie know a greyhound never lacks attention at their farm either. 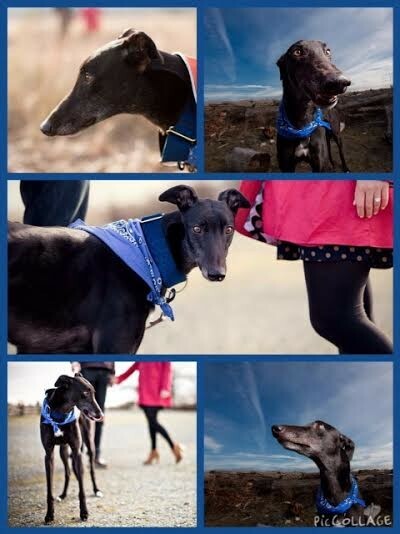 By about 18 months Otto was off to Southland Park Gaming and Racing with his sister Remy, while their siblings went to Bluffs Run, in Iowa, and Historic Derby Lane in St Petersburg Florida. Although Otto’s race career looked promising in schooling, his career at Southland was never developed as expected. It was decided that some R&R down in Florida and some more puppy friendly competition was in order. While he had some nice runs in Florida we soon learned that a sore hip was bothering him and that it was time for early retirement. So what happens when my pups are slow or can no longer run? That’s right, they are spoiled rotten of course by the wonderful folks that adopt them. Slappin’, renamed Otto in his new home, had quite a journey, traveling all the way from Florida to the Vancouver Canada area where he was adopted by Anne and Cody. Anne said that Otto is her first dog and she couldn’t imagine a better buddy. These are some photos they sent me from a couple years back. They had taken Otto to their engagement photo session and Anne says he stole the show! Thank you to all the people involved in helping find just the right home for our greyhounds, and to those that spoil them rotten! A racing greyhound is an amazing athlete. I like to think of them as a combination of a thoroughbred racehorse and a race car driver. In horse racing, it is the animal that is running the race, but the jockey that is making the decisions. In car racing, the driver makes the decisions, but it is a machine that is powering him. 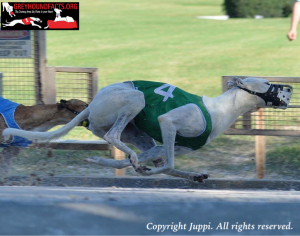 In greyhound racing, the greyhound is both the “engine” and the decision maker. A successful racing greyhound will also have drive and determination. But, he will also have the ability to make split second adjustments. A race doesn’t last very long and they are covering a lot of ground in a short period of time. Decisions and adjustments must be made quickly and to win the race, they must be the right one(s). This video is a perfect example of the importance of drive, determination and smarts! Watch the greyhound coming out of the 3rd box (white racing blanket). She recovers from the trouble in the first turn. Then late on the backstretch she’s blocked, “stops”, recovers and drives home for the win. Great race….she would not be denied! We often read, on social media, messages from people who are having some difficulty either understanding or coping with certain retired greyhound behaviors. Usually, advice from a remarkable array of adoption professionals, experienced adopters, even veterinarians and racing professionals is immediately forthcoming. One thing they are seldom told, but something they need to know, is that racing greyhounds are not bred to be pets. That particular aspect of selectivity never enters into the decision of whether or not the individual is a greyhound worthy of carrying on with the breed. Contemporary Racing Greyhounds are performance dogs, and superior performance in head to head competition is what usually determines who does and who doesn’t get to input the genepool. “Petability” is not one of the criteria used in this selection process involving the breeding of modern racing greyhounds. Many greyhounds, while they are superb track athletes and quite prolific as breeders, can have personality traits or exhibit certain behaviors that are not necessarily desirable in a pet, or conducive toward making an easy adjustment to life as a companion dog or family pet. However, one attribute that is quite desirable in a racing dog, and in one who might be used for breeding, is what we term “keen-ness”. This involves a heightened ability to perceive one’s surroundings, and a heightened ability to react quickly and decisively to them. “Keen-ness”, in a track racer, is expressed as an irrepressible willingness to partake in racing competition, or to simply chase with abandon. Keen-ness, in a sire or dam, is something we want them to pass onto their offspring. Lee Lee pictured with permission from Gillian Lee. Especially keen dogs are very focused, often to the point where they can be oblivious to the humans around them. When something gets their blood up, the result can be less than ideal in a non-sporting, uncontrolled venue. These unusual powers of perception can also predispose them to skittishness and nervousness, as they inevitably perceive and react to the known as well as the unknown, quite often to a degree not always in common with other breeds. Remember this–your retired greyhound, at any given moment, in any situation, is, in his own mind, both predator and prey. This primal aspect is held very close beneath their thin skin, as a result of centuries of highly selective breeding to a specific function. It is the essence of who they are. Now, seldom are these unique qualities deal breakers to potential adopters–but it is important to understand that greyhounds are primal, reactive, competitive dogs by nature, and when they are bred for “racing temperament”, it isn’t for the same sort of temperamental qualities that we might wish to see in a Pug or a Maltese. The fact that so many retiring racing greyhounds are still able to make a seamless adjustment in the face of a quantum leap of change in their lives, from racing athlete to family pet, is a tribute to their own innate intelligence and already learned faith in their humans. Their coursing and racing heritage, and the mystical, ethereal aspects of their nature that it preserves, once taken into account and embraced, is just a bonus.